WWW.POTATOGROWER.COM 17 Feature Three S Three S Ranch of Blanca, Colo., harvests near- ly 880,000 hundredweight of potatoes yearly, and they have no plans of slowing down. In fact, they hope to increase those num- bers. Jared Smith, the youngest of Three S's three operators, says the ranch has always known commercial potatoes. Now they are adding seed potatoes to their business plan. Three S Ranch has been around since 1917, when Smith's great-grandfather, E.F. Smith, an educator, made the 180-mile trip from Minturn, Colo., to buy a parcel of land in Blanca at 50 cents an acre. Starting with cattle, the ranch eventually moved over to crop production; their first potato crop was harvested in 1979. Today, the ranch grows barley, wheat and dairy hay along with its potatoes. 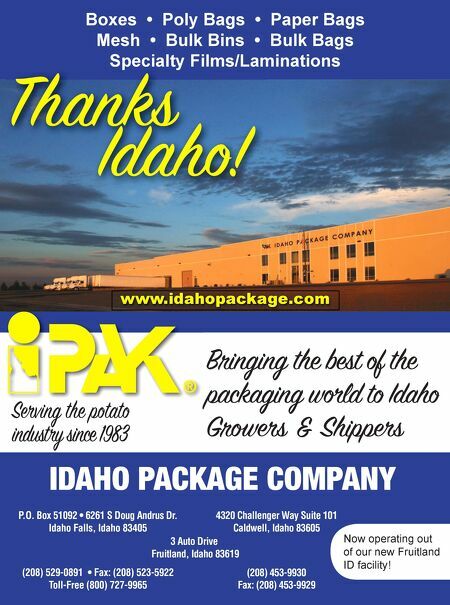 Smith's father and grandfather bought into Blanca Potato, a packing company and warehouse that ships 10 to 30 semi-truck loads of potatoes out of the warehouse daily and is the largest employer in Blanca. "High-quality, low-disease seed is appealing to me," Smith says. "Working with seed, we are now able to manage and store our seed from beginning to end, and there will be a lot of advantages. I think we will prove that this coming year." Three S Ranch recently bought into growing seed potatoes along- side Salazar Farms and Price Farms, two entities that have years of experience in the seed industry. Leroy Salazar of Salazar farms in San Acacio, Colo., has been growing seed for years, and Three S Ranch had the opportuni- ty to buy land he was leasing. Salazar needed partners and ap- proached Three S Ranch's owners, Jared and Monty Smith and Cole Wakasugi. "It's interesting to us because we've been customers for years but were never involved in growing seed," says Jared Smith. "This was an opportunity to get involved with someone who already knows the ins and outs of the seed industry. On top of that, it al- lows us to vertically integrate and create a consistent, clean seed supply." 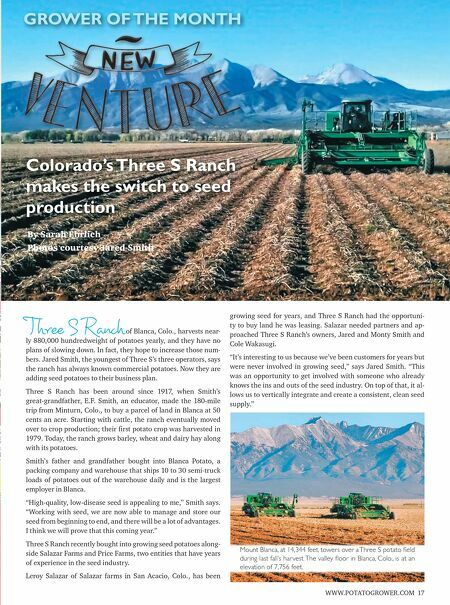 Colorado's Three S Ranch makes the switch to seed production GROWER OF THE MONTH By Sarah Ehrlich Photos courtesy Jared Smith PG 20 | FSA'S STORAGE LOAN PROGRAM PG 40 www.potatogrower.com SEPTEMBER 2017 • $3.95 PAGE 16 PAGE 16 PAGE 28 PAGE 28 www.potatogrower.com JUNE 2017 • $3.95 INSURANCE PAGE 26 PG 20 PG 20 PG 20 Mount Blanca, at 14,344 feet, towers over a Three S potato field during last fall's harvest. The valley floor in Blanca, Colo., is at an elevation of 7,756 feet.